Our Portuguese Flor de Sal is back for limited time only! 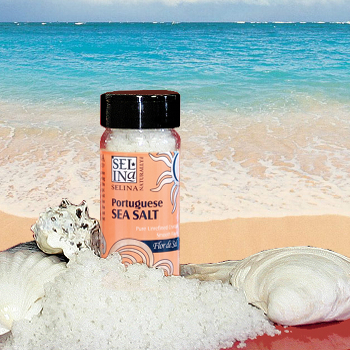 Selina Naturally® Brand Portuguese Sea Salts are award-winning culinary classics that will transform any dish with their clean, elegant flavor. 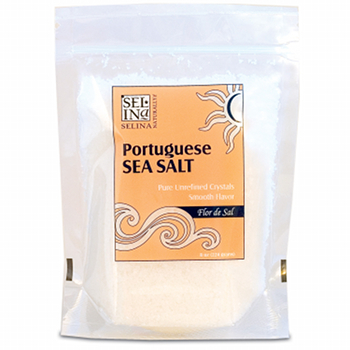 Our Portuguese Flor de Sal is a delicate, gourmet finishing salt, similar to our Flower of the Ocean®. These artisan salts come from the scenic Algarve province of Portugal, in the Ria Formasa Natural Reserve, an area that is geographically ideal for natural salt harvesting. This beautiful region has a history of salt harvesting which goes back to the time of the Roman Empire. Even today, this salt is still hand-harvested and sun dried by the marenotos (salt gatherers) in the traditional manner, using gravity and gates to funnel seawater into the salt pans for collecting. Produced by a 4th generation salter, Portugual whole-crystal salt has a brilliant clear, whitish color, but is totally unrefined. We were fortunate to find a supplier whose standards in quality far exceed any other producer in the region. Their commitment to excellence was recognized in 2006, when the salt received the “Superior Taste” Award from the International Taste & Quality Institute.